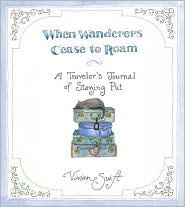 Loves Books and Tea: When Wanderers Cease to Roam, Vivian Swift. When Wanderers Cease to Roam, Vivian Swift. This is a most unusual memoir. I love that it engaged me from the first page to the last. Swift's concept as well as her art are marvelous. i just read this too! it's a little odd, but rather lovely. just this side of twee. Oh, that cover makes me want to get it right now, how sweet and inviting it looks.